Amsellem said that his new party "is heading towards the unknown in the aims of becoming an influential political force in the State of Israel". Amsellem was speaking at a launch party for the new movement held in Jerusalem. It is estimated that he will try to merge his new party with the united national-religious list ahead of the next elections. "We didn't casually decide on this new path. We did so after deep thought and after gauging the public mood," Amsellem noted. He added that his party's agenda would focus on bringing the secular and religious sectors closer together, encouraging the haredi sector to join the workforce, separating religion from politics – but not from the state - campaigning against communal segregation in haredi communities, and recognition of IDF conversions. Amsellem said that efforts must be made to stop prompting vast numbers of people within the nation who are already shrinking away from religion and tradition to hate religion. "The unity of the Jewish people is its Iron Dome. We will not forsake it," he said. During his speech Amsellem made it clear that he respects the rabbis who are "the great sages of Israel" but not the parties run by their aids or others with dubious interests while illegitimately take advantage of the rabbis' reputation. The chairman of the Am Shalem movement, Moshe Zarfati called the foundation of the new movement "a message of unity, tolerance, equality and true deeply rooted Judaism." According to Zarfati, "we are standing at the precipice of a revolution". 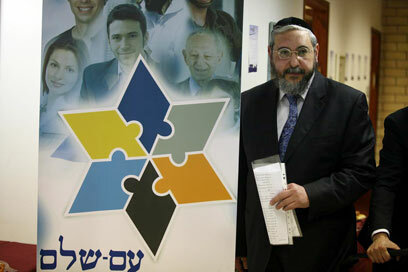 Zarfati presented survey results that showed that 6% of the voting public said that there was a high to very high chance that they would vote for a party led by Rabbi Amsellem. He believes that it was within the new party's power to sweep five mandates, and in the party's target audience it could reach 13 mandates. The party chairman also announced the launch of "Operation Ten Thousand", to get 10,000 new members to join the movement. Zarfati claims that "we have the support of many important rabbis. They remain anonymous at the moment for understandable reasons, but they will reveal themselves when the time is right." See all talkbacks "Shas rebel MK founds new movement"